On February 23, 1455, many scholars agree that the Gutenberg Bible, one the first books created with moveable type in Western Europe, was published in Mainz, Germany. The Gutenberg Bible was the first European book published on a printing press using moveable metal type. Printed in Latin, the right page here displays "Genesi," or Genesis, the first book of the Christian Bible. 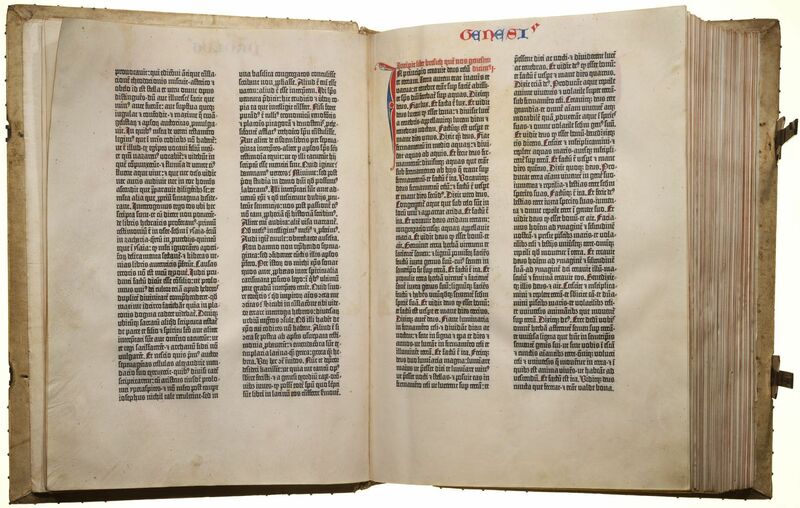 On February 23, 1455, many scholars agree that the Gutenberg Bible was published in Mainz, Germany. The Gutenberg Bible was one of the first books created on a printing press with moveable metal type. (China and Korea had been using the technology for more than a hundred years.) Moveable type consists of blocks of individual letters and symbols that can quickly be arranged and re-arranged to create different words and phrases. The type is then coated with ink and pressed into paper or vellum, an expensive parchment made of animal skin. The Gutenberg Bible is named after its creator, Johannes Gutenberg. Gutenberg himself invented the wooden printing press, metal types, and oil-based ink used in the new printing process. Historians think Gutenberg printed about 160-180 Bibles in 1455. Today, 48 Gutenberg Bibles survive in whole or in part. Before publication of the Gutenberg Bible, all Western manuscripts had to be hand-copied, which could take years and cost the wages of an entire lifetime. Books were rare and limited to very wealthy individuals, churches or monasteries, or universities. Although Gutenberg Bibles were still relatively rare and expensive, the technology set off the so-called “Gutenberg Revolution,” which made books and knowledge available to almost all literate people. able to read and write. slippery, greasy liquid that is usually flammable and does not mix with water. Oils can be processed from plants, animal fats, minerals, and man-made substances. carefully prepared skin of goats or other animals used as material on which to write. art and science of public policy. machine used for transferring images onto paper or parchment with ink. to provide a written piece of work, such as a book or newspaper, for sale or distribution. metal block with a letter or symbol engraved on one side, used in printing presses. prepared and treated skin of a calf, young goat, or lamb used as a writing surface.